I love making things for people that make them smile. A customer came to me with a project that she intended to be Christmas gifts for her girls. As we got to brainstorming colors and how to make them the same but different, she quickly realized her nieces would love them too. So what is this amazing project you ask? 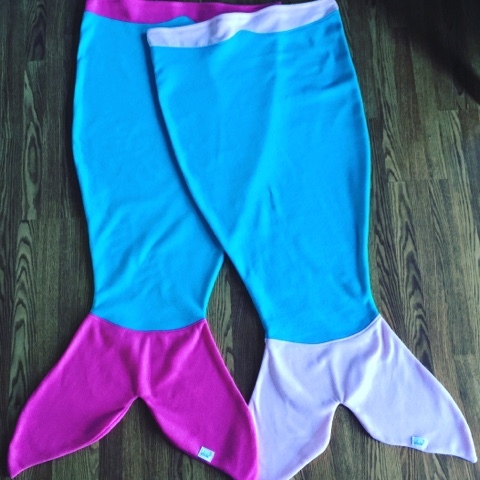 Just these adorable mermaid tail blankets!! They are made like a sleeping bag so the girls put their feet all the way in to the bottom and magically become a mermaid! We wanted them to be slightly different so the sisters could tell them apart. With one light pink and one dark pink, the girls will still feel like they got the same blanket but will not have trouble telling which one belongs to them. After seeing four of these adorable blankets, I have decided I want to be a mermaid. Don't you?